Unripe strawberries are too tart to eat. But pickled green strawberries are amazing and so easy to make. Green strawberries have become one of the biggest summer restaurant trends, especially pickled green strawberries. And while they might seem daunting they are one of the easiest and tastiest things to make at home. In essence they are under ripe red strawberries, which begin white and juicy then turn a golden green, often with pink blushes and become tart and even bitter. The flesh is more firm than ripe strawberries making them easier to work with. The art acidity of green strawberries, especially when pickled work really well with both sweet and savoury – as well as salty and fattier meats. While it may seem strange to imagine strawberries in their unripe form as delicious think about green mango or papaya which are also so delicious before they are ripe. Don’t replace green strawberries in your favourite red strawberry recipe, they just don’t bring the sweetness you would need. Instead look to replace tomatoes, citrus and unripe fruit with them. They can be used in salsas, mignonettes, or to replace capers. They are great on cheese plates, in vinaigrettes or served with pates and terrines. Impress your friends with a green strawberry gazpacho, ice cream or granite. 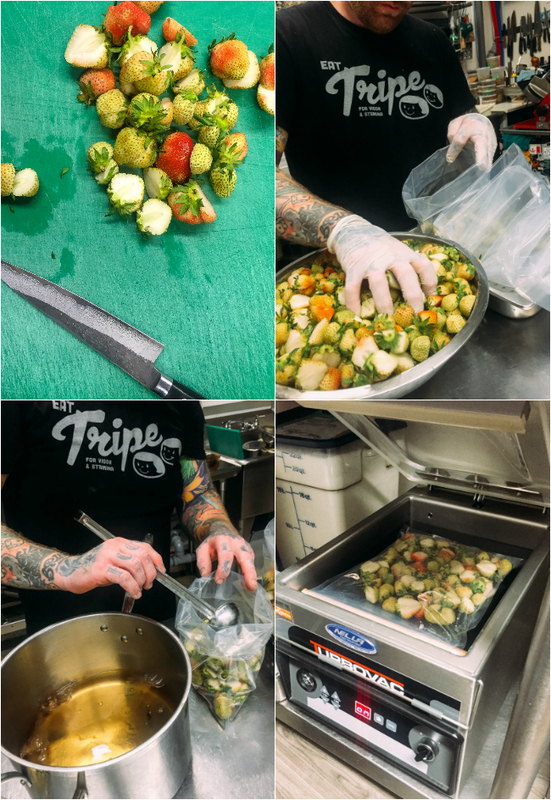 While many are familiar with pickling fruits and vegetables in jars to preserve them we chose to put them in a pickle brine and then vacuum seal them. Our vacuum sealer at Loka is commercial grade but we’ve also used vacuum sealer for home use. 1) You use just a fraction of liquid, which saves on the cost. 2) You use a fraction of the space, these strawberries can be stacked in the fridge. This pickled green strawberry recipe is basic, without spices or herbs, so there would be more flexibility in using them. For example, you can always add fennel to your final recipe, but there’s nothing worse than wanting to use them and realizing the fennel you put in the pickle doesn’t mesh with the recipe you wanted to use them in. We’ve provided the vacuum sealed proportions, to pickle in jars simply multiply the proportions by 7 to 10. Ensure that the liquid fully covers the berries. Bring cider, water, sugar and salt to a boil. Ensure sugar and salt is fully dissolved and remove from stove and let cool. Divide strawberries evenly amongst six bags, add 4 oz of brine to each bag. If you’re already pickling green strawberries let us know how you’re using them. Hi! This was an interesting post. Is there anyway to replace the sugar? This recipe is new for me, I never taste strawberry pickle, It is too easy recipe and surely its taste will good, Thanks for sharing such a unique pickle recipe. First time heard about pickles of Green Strawberries. Now I am going to make it too. But you didn’t mention that for how much time or days, I will have to keep it on refrigeration. It will ready to eat instantly or i will have to wait. Never thought about having strawberries green before … looks like I got something to experiment with this summer! This is the first time that I heard about green strawberries..thanks new information..good post..
I’ve eaten pickled watermelon rind, but never pickled strawberries! My mother used to make green tomato mincemeat, which was also great. Only made 1/5th of the recipe just in case. I added a pinch of taragon as fennel would likely discolour 🙁 Will try adding a pinch of smoked salt another time and likely will switch from white sugar to dextrose (corn sugar) for less intense sweet note. After 2 weeks, opened. Still very firm. I diced them and added firm ripe diced kiwi as an accompaniment to seared fois gras. Nice contrast. They should maintain firmness and you are right they are the perfect accompaniment to anything rich, especially foie! 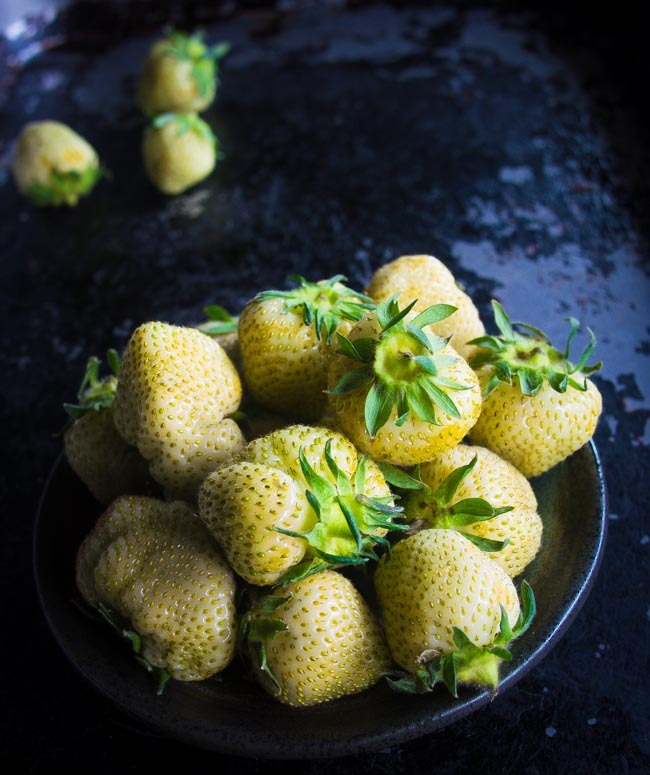 This is super interesting, I have never personally tried using green strawberries in any of my recipes yet – but when you mentioned using them in salsa that really sparked my interest! I am more than excited to try pickling these and incorporating them into more of my meals. I think I can really catch my friends and family off guard if they taste something tart like a pickled green strawberry in something. Thank you for sharing the recipe! I’m thrilled that you liked it, let me know what they think! I dont’ have a vacuum sealer, so I’ll use jars. You could store them but you would need to can/preserve them in a water bath as you would do for normal pickles and they would last a year in a cool, dark space.